It’s hard to talk about Internet marketing nowadays without focusing on influencer marketing, which seems to be the method of choice for numerous content marketers out there. As opposed to some other marketing concepts, influencer marketing doesn’t involve marketing to your customers directly in order to boost your conversion rates. Instead, it revolves around influencing a group of people, or separate individuals, whose word holds a great deal of weight among your target audience, and which can influence their decisions. Your goal as a marketer is to establish a fruitful partnership with influencers that will be beneficial for both parties. As we’ve pointed out, an influencer can be anybody: a journalist, an expert in some field, or perhaps even a blogger or a vlogger with a large number of followers which tune in regularly to check out what the influencer has to say. 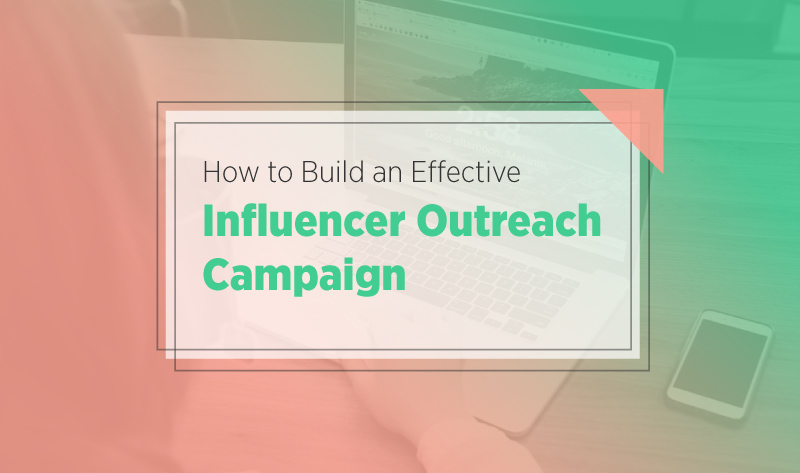 Because influencer marketing involves methods that are much less aggressive, it is somewhat tricky to find the right balance between making an impact, while remaining subtle and genuine, which is why we have put together this step-by-step guide on influencer marketing which can help you in building your own influencer outreach campaign. First of all, you need to be clear on what your niche is, because, it will be a complete waste of time for you to attempt and develop a relationship with an influencer which may be brilliant, but completely irrelevant to your current niche, and therefore unable to convert the readers into paid customers. Once you have done that, you need to search the Internet and figure out which influencer might be the best choice to help your cause. It can be as simple as typing in the most common keywords regarding the niche, and picking the names which tend to pop up the most. You can also find influencers on networks such LinkedIn, Twitter, or by checking out the most popular blogs and its authors. Of course, you will have to narrow down your list, because there will be plenty of them, and getting in touch with every single one is too time-consuming. Once you have singled out those which you think are perfect for your campaign, you will need to make them aware of your presence. Now, because you will be dealing with people, and not robots, you can’t really strong-arm them into spreading awareness about your brand, the same way you can’t make someone become your friend after you have just met them. It takes a bit of time, so the first thing you should do is to establish a connection in a subtle way, such as liking one of their comments every once in a while or commenting on their posts. After enough of those, you can follow them on Twitter or any other social media they are active on and retweet their posts. And they will be active, because social networks are their main tools of the job. Once they have you in their sight, it is time for you to contact your influencers. Mind to always be honest with them right from the start. They know why you are contacting them, so be open about your intentions. Another thing to keep in mind is to approach each of them a little bit differently. Whether you are contacting them via email or their LinkedIn profile, don’t just send them a generic message. Because you have followed their social media activity, you have a pretty good idea about the way they think, so use that when you are getting in touch with them. Make them feel like you’ve chosen them out of hundreds or thousands of other influencers. It’s sort of like dating, really, so it pays to be original and to the point. Once you have contacted your influencer, make sure they know that your potential collaboration will be beneficial for them, as well. For instance, you could say that your brand or company has a large online following, and that they would stand to benefit from a whole legion of new followers, if you were to share their comments or content through your website, blog or social media accounts. In return, they would mention your brand, product, or a service to their audience. Also, you could provide them with a demo, or even a free version of what you have to offer, as a token of your appreciation, but also as a way of them getting to know your brand a lot better. If what you have to offer is good, they will be more than willing to share it with their followers. The important thing to remember is to keep developing your relationship with your influencers, even after they have helped you and your brand in getting more paid customers. Don’t just abandon them once they have served their purpose. Besides, you never know when they are going to branch out into some other area which may prove beneficial for you. Apart from sending them the occasional message thanking them for the work they have done for you, you can go the extra mile and meet with them in person. If meeting in person is not an option, you can always talk to them via Skype. You probably won’t be the only marketer they are working with, but you can be their favorite one, which means they would be willing to put in the additional effort to promote your brand. If you are promoting a new product, make sure they are on the guest list. Influencer marketing puts people front and center, only this time it’s not about the audience, but about those who they look up to for guidance and advice. Instead of taking the time to develop a marketing strategy, you are now focusing on developing a relationship with another human being. It’s a delicate process, but one which returns brilliant results.